Alex E. Chávez, an assistant professor in anthropology and Fellow of the Institute for Latino Studies (ILS), sees parallels between longstanding Latino migration to the United States and the current crisis of Middle Eastern and North African migration to Europe. He was part of a group of ILS faculty fellows who met with Italian scholars to discuss immigration at Notre Dame’s Global Gateway Center in Rome in October. 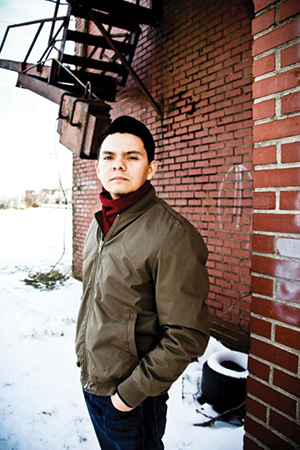 Chávez, a son of Mexican immigrants who grew up in Texas and earned a Ph.D. in anthropology from the University of Texas at Austin, focuses on ways that transnational migrants use expressive culture to create senses of home and belonging in places where they may not be welcome. His work situates these expressions in relation to the global geopolitical and economic factors that impact migrants’ everyday life, often overlooked by those who label immigrants as criminals. “That’s a really impoverished understanding of how transnational migration occurs,” says Chávez, whose book, “¡Huapango! : Mexican Music, Bordered Lives, and the Sounds of Crossing,” will be published by Duke University Press. “Most people that come here, particularly from Latin America, are labor migrants. Intensified labor migration from Latin America is directly linked to transnational economic integration between the United States and Latin America, and it’s nothing new. These circuits of migration, at times braced by active labor recruitment efforts on the part of the United States, are decades in the making, in some instances dating back to the 19th century. The immigration context in the United States, while longer-term — for instance, parts of the United States were settled by Mexicans before Europeans — is in some cases equally as catastrophic, particularly considering escalating migrant deaths along the U.S.–Mexico border over the past 20 years. These realizations could help inform understanding of the European crisis, and reflection on the European situation could help Americans attain a comparative perspective with which to temper our immigration discussions, Chávez says. Originally published by Gene Stowe at news.nd.edu on January 06, 2016.